The 30th Inter-Sessional Meeting of the Conference of Heads of Government of the Caribbean Community (CARICOM) held at Frigate Bay, St Kitts and Nevis 26-27, February 2019. 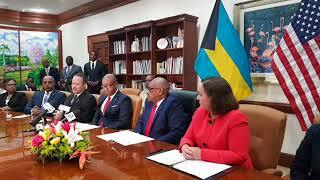 21 February, 2019 -- The Bahamas signs a $12 million Bilateral Agreement with China for Economic and Technical Cooperation. 14 February, 2019 --The Hon. Darren A. Henfield, MP, Minister of Foreign Affairs, received a courtesy call by His Excellency Jim Kelly, Ambassador of Ireland to The Bahamas (resident in Canada), and Her Excellency Dympna Hayes, Special Envoy of the Government of Ireland and Committee Member of the United Nations Security Council Campaign of Ireland. 13 February, 2019 -- Mr. Giuseppe Renda, Head of Panama City Regional Delegation which covers The Bahamas for the International Committee of the Red Cross (ICRC) paid a courtesy call on the Hon. Darren A. Henfield, MP, Minister of Foreign Affairs. 12 February, 2019 -- His Excellency Andrei, A. Guskov, Non-Resident Ambassador-Designate of the Russian Federation, paid a courtesy call on the Hon. Darren A. Henfield, MP, Minister of Foreign Affairs. 24 January, 2019-- The Hon. Sean Astwood, Deputy Premier, Minister of Border Control and Employment for the Turks and Caicos Island and the Hon. 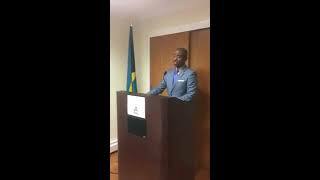 Darren Henfield, Minister of Foreign Affairs, along with Senior Officials from both jurisdictions, met in Providenciales, to discuss issues relating to border control and other matters of mutual interest. 23rd January, 2019--Dame Maguerite Pindling, Governor General of The Commonwealth of The Bahamas with His Excellency Huang Qinguo and his wife, Madame Zheng Chuncao at the 2019 Chinese Spring Festival. 2019 Government Chinese Announces Scholarship Opportunities. For more information See International Scholarships Section. 21 January, 2019--Her Excellency, the Most Honourable Dame Marguerite Pindling, Governor General, received Letters of Credence from His Excellency Dr. Bernd von Munchow-Pohl, Ambassador-Designate of the Federal Republic of Germany to the Commonwealth of The Bahamas, during a brief ceremony at Government House. Thursday, 13th December, 2018-- Non-Resident Ambassador Extraordinary and Plenipotentiary of the Commonwealth of The Bahamas to the Holy See, presented his Letters of Credence to His Holiness Pope Francis, at the Apostolic Palace, Vatican State City. Thursday, 13th December, 2018-- Non-Resident Ambassador Extraordinary and Plenipotentiary of the Commonwealth of The Bahamas, pictured with his family and members of his delegation at the Vatican. Thursday, 29 November 2018-- Minister Darren Henfield and His Excellency Mude Sevala Naik, High Commissioner of India signed a visa waiver agreement for holders of Bahamian and Indian Diplomatic and Official Passports. His Excellency Jeffrey Williams, Ambassador for the Commonwealth of The Bahamas to the Republic of Haiti, visited the Embassy of the United States of America in Haiti, on Tuesday, 4 December 2018, to sign the book of condolences for the passing of former President of the United States of America, George H. W. Bush. 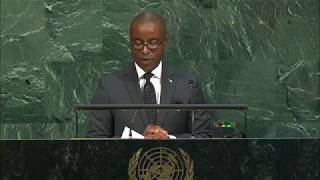 23 Sep 2017 – Darren Allan Henfield, Minister for Foreign Affairs of the Bahamas, addresses the general debate of the 72nd Session of the General Assembly of the UN (New York, 19 – 25 September 2017).